If you have visited Ireland's scenic southwest before, you already know about our breathtaking scenery and the famous Irish welcome that awaits you in every town and village. Use the links below for your travel plans, or use the CONTACT > page if you have a question. We hope you can stay a while! :: From CORK take the N22 to Killarney, on reaching Killarney follow signs for Muckross Road N71, the hotel is on the left-hand side approximately 1km from Killarney town centre. 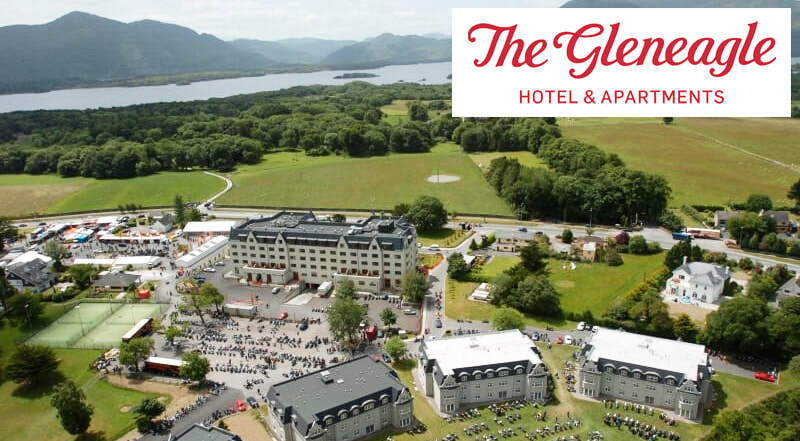 :: From KERRY AIRPORT, take the N22 towards Killarney & follow signs for the Muckross Road N71, the Gleneagles hotel is on the left-hand side approximately 1km from Killarney town centre. :: From SHANNON AIRPORT, take the N18 to Limerick, take the N21 to Castleisland, then take the N22 to Killarney and follow the signs for the Muckross Road. The Gleneagle Hotel (onsite) offers a free shuttle bus from Killarney train station, meeting every train from Dublin up to 5pm daily. The Convention venue is set amid the stunning Kerry landscape, with extensive accommodation options right next door (The Gleneagle Hotel) and nearby in the Lake Hotel, Randles Hotel and Cahernane House Hotel. Muckross Road, Castlelough, Killarney, Co. Kerry.